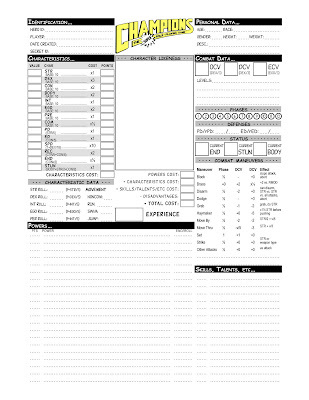 Yes, here's yet another superhero RPG character sheet. I'm posting this sheet because, at this very moment, I'm anxiously awaiting the arrival of an original-shrink-wrapped, NM condition Champions second-edition box set, and original-shrink-wrapped copies of Champions II and Champions III. I wasn't introduced to this game until later in my role-playing days (around '89, IIRC). As regular readers will no doubt already know (a cookie will be awarded to anyone who actually knows this without going to find it in my blog archives) I'm a Villains & Vigilantes guy first and foremost. And anybody who's been around the superhero RPG circuit for a decent length of time knows how well Champions players and V&V players usually get along. I only played the game once - in fact, I spent about three times as much time making my character as I did playing him. I don't blame the game, though - I blame the GM. He threw a Champions FNG (yours truly) up against a super-munchkin villain whom the poor FNG's PC had zero chance of even scratching. Add to that the fact that the poor n00b (me again) knew zip, zero, zilch about how the system worked, and had zip, zero, zilch assistance from the GM or any of the other players who did and you have a surefire recipe for a failed game session. That session, even more than the daunting character creation, turned me off Champions for a long, long time. I tried the game again several years later, this time from the GM's chair, in it's fourth-edition form, as a mid-campaign replacement for a game I was running for my good friend Terry. (Sorry, I guess that's "Theron" now.) Unfortunately, his character, "Aegis," hinged on certain V&V powers that didn't translate well into Champions. The V&V atmosphere didn't seem to translate, either. So, here we are again. 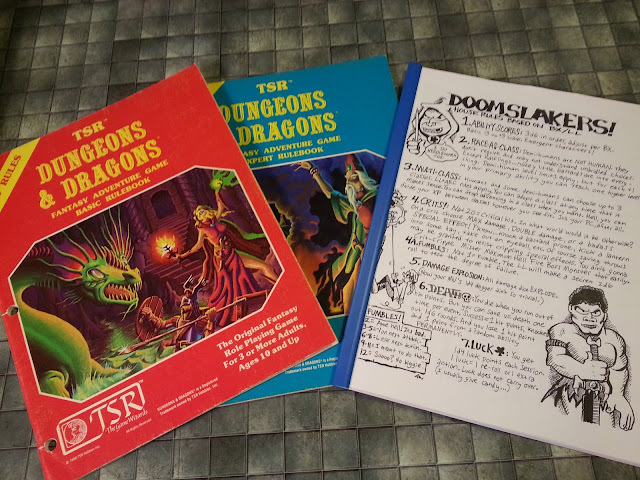 I couldn't pass up the opportunity to grab these pieces of superhero RPG history. Even though I've personally had bad experiences playing and attempting to run the game, I still recall warmly and fondly the time I spent looking through Terry's (Sorry, I guess - well, you know...) Champions characters and listening to his anecdotes of his favorite character's ("Mellow") exploits. I still recall the awesome illustrations Terry came up with for Mellow, and just looking at pictures of these old books takes me to a warm, fuzzy, nostalgiac place. I'm hoping that the "third time's a charm" idiom holds true when I run this game for my family. Thanks Chris. You really pissed me off. Your post reminded me of yet another game I loved which has disappeared from my gaming collection through the years. Added to Gamma World, Holmes Basic, Bushido, Aftermath and Top Secret. I swear my ex-wife found a box of gaming stuff and ditched it all. Anyway, lots of good memories playing original Champions, which, as far as I know, was the first super hero RPG. My character was named Phantasm. Yes, I still remember those games from over 25 years ago. Good stuff. And so you are going to post the Gamma World sheets and yet there poor Zumie Blu sits stranded halfway to the moon.. FOR SHAME.. FOR SHAME I SAY!!!! Hey! No comments from the peanut gallery. Awww yeah, Love the Champs. 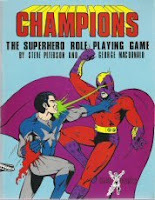 Started running superhero games in the late 70's with Superhero 2044, ran a lot of V&V, but finally settled in the early 80's with Champions. My long running Champs games in the 90's were amazingly fun for me and for the players. Hope to get another campaign going (maybe if I can get my current D&D group bored of fantasy for awhile).